On a hot summer day, what is the favorite treat of most people? Ice cream! As that old childhood ditty proclaims “I scream, you scream, we all scream for ice cream!” But did you know this familiar refrain actually comes from a real song with that exact phrase as its title? It was performed by Harry Reser’s Six Jumping Jacks and was recorded on January 14, 1928. Let’s face it. We love ice cream. So, it should have its own special day, shouldn’t it? Wait! Should it not have its own special month? Well, it should, and it does! In 1984, President Ronald Reagan proclaimed July as National Ice Cream Month and the third Sunday in July as National Ice Cream Day! But there are other connections between ice cream and politics. In 1986, for example, Clint Eastwood, an ardent ice cream fan, ran for mayor of Carmel, California, partly because of his opposition to a local ordinance forbidding the selling and eating of ice cream on public streets. Eastwood won and eventually helped overturn the ordinance. Perhaps actors make such good politicians because they know we love ice cream! Did you know that Charles E. Minches of St. Louis, Missouri is credited with inventing the ice cream cone? On July 23, 1904, at the World’s Fair in St. Louis, he filled a pastry cone with two scoops of ice cream to make what some believe was the first ice cream cone. There is some controversy over this claim, though. Italo Marchiony of New York City filed a patent for the ice cream cone just months before the Fair opened. He had been selling lemon ice in cones since as early as 1896. Either way, though, the ice cream cone has served as the perfect American treat for more than a century! 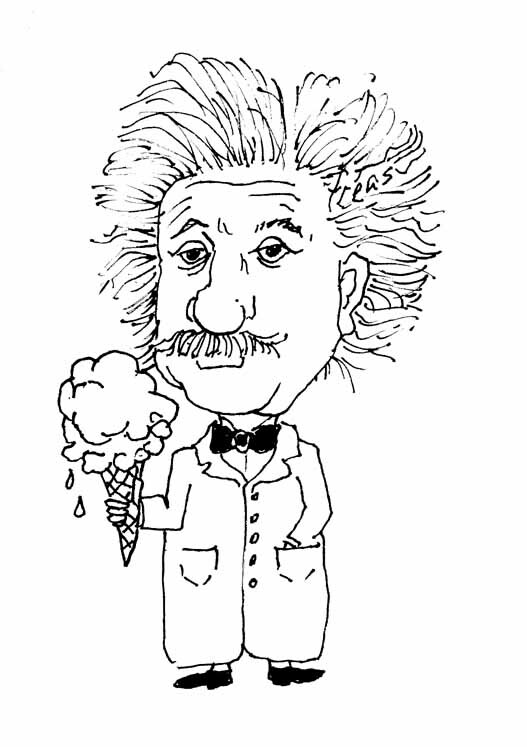 Even Albert Einstein loved ice cream. That’s right! Indeed, his first act upon arriving at Princeton in 1933 was to buy an ice cream cone. He ordered a vanilla ice cream cone with chocolate sprinkles. John Lampe, the Princeton student who served him, is quoted as saying, “The great man looked at the cone, smiled at me and pointed his thumb first at the cone and then at himself.” So, for Albert Einstein, deciding upon the perfect treat was a no-brainer. But then, as we all know, you don’t have to be a genius to figure that one out! The history of ice cream stretches back for centuries. In fact, a frozen mixture of milk and rice was first used in China around 200 B.C., and the Roman Emperor Nero had ice brought down to Rome from the mountains and combined it with fruit toppings in the first century A.D. Arabs were the first to use milk as a major ingredient in ice cream and to sweeten the mix with sugar. As early as the 10th century, ice cream was widespread within many of the Arab world’s major cities, such as Baghdad, Damascus, and Cairo. Ice cream recipes were first published in the 18th century in England and America, with the first one appearing in London in 1718. Ice cream was first introduced to the United States by Quaker colonists, who brought their ice cream recipes with them to the New World. Confectioners sold ice cream at their shops in New York and other cities during the colonial era. Ben Franklin, George Washington, and Thomas Jefferson were known to have regularly eaten and served ice cream. First Lady Dolly Madison is also closely associated with the early history of ice cream in the United States. As the wife of U.S. President James Madison, she served ice cream at her husband’s Inaugural Ball in 1813. In the modern age of mass commercial production of ice cream, we’ve come a long way from the hand-cranked churn which was still being used to make ice cream in the first half of the 20th century. This process involved ice and salt for cooling and required someone to manually turn the crank handle to create the mixture of frozen delight. But ice cream was no less a treat in the old days. Depending on your age, you might have heard your grandpa or great-grandma say, “Back in our day, we made our own ice cream and we liked it!” And they weren’t kidding! One of the first large scale operations to make ice cream was owned by Jacob Fussell of Baltimore, Maryland. His dairy products came from farms in York County, Pennsylvania. He built his first ice cream factory in Seven Valleys, Pennsylvania, in 1851. Two years later, he moved his factory to Baltimore. It was not until 1926, however, that the continuous-process freezer enabled the commercial mass production of ice cream. This innovation marked the birth of the modern ice cream industry. We now export 40 million gallons of ice cream to other countries annually. But don’t worry about not having enough ice cream left over for you. We make millions and millions of gallons for us to enjoy here at home! Americans spend a cool $20 billion a year on ice cream, and the U.S. produces 1.6 billion gallons of frozen concoctions annually. Wow! 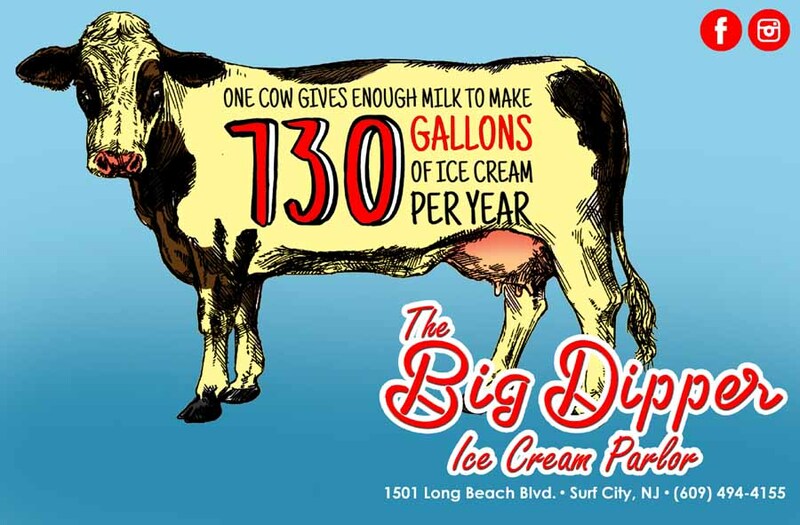 So, as you sit sweltering in the sun, I want you to imagine that hot fudge sundae, ice cream cone, root beer float, or milk shake that’s waiting for you somewhere here on LBI. And, of course, you must keep in mind that things always taste better at the Shore. Yum! So, what are you waiting for? Grab the family, get into the car, and head for some ice cream! What? You’re reading this after National Ice Cream Day? Well, no need to worry. No matter what the day or month of the year, it is always a good day for ice cream! Who wants ice cream? I do! I do!